tips and tools to master motivation! In 2016… will you be one of the MANY who become overwhelmed, frustrated and fed-up OR one of the FEW who TRANSFORM their POTENTIAL into PERFORMANCE with CHAMPION ATTITUDE, BELIEF & CONFIDENCE? May this be the year that you get results — stop making resolutions and start taking action! Shelley Taylor-Smith has the unique quality that allows her to work with people from all walks of life. She will empower you to create your Champion Mindset® and improve the quality of your life, both personally and professionally. Success Coaching is a partnership designed to help you achieve success, however you define success in your life. 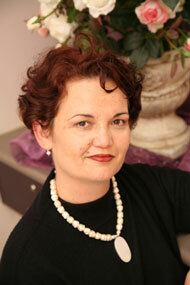 Shelley believes you have the answers and she is trained to bring them out (painlessly!). Together we will discover your Champion potential, create your Champion Mindset® and plan a course of action so you achieve what I passionately believe is your birthright…..your birthright to achieve your dreams, your goals! So let’s make it happen today! It is me personally coaching you, 1on1 and how good would that be to have your own personal coach cheering you on, believing in you and teaching you how-to believe in yourself. The focus is entirely on you and your needs. IS ACHIEVING YOUR GOALS PAINFUL FOR YOU? When you ask a successful person how they got to the top, they’ll often say that it was through hard work, dedication and the help of a coach. Achieving the dreams of your life, your health and fitness, your career, your family, your business…..doesn’t have to be painful – If you’re open to a new Mindset! Help for getting you back in the driver’s seat, in-control of your life! 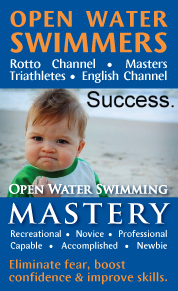 So dive in and discover your Champion potential, how-to achieve your goals and be swimming in Success! Success Coaching is a partnership designed to help you achieve success, however you define success in your life. Shelley believes you have the answers and she is trained to bring them out (painlessly!). Combining the tools and techniques, strategies and solutions, from her success & experience in the 7 consecutive years ranked World No.1, Success Coach, Shelley Taylor-Smith can show you how to create what you want right now. Whether you need to re-ignite your passion or have just discovered your passion, Success Coaching will help in whichever area of your life you choose to focus on. You are not alone. Act now….take control and create the life you want! Call Champion Mindset® 1300 78 41 70. Developing a Champion Mindset® changes your world, and empowers you to achieve more than your wildest dreams previously allowed you to imagine. Contact us at coaching@championmindset.com.au or call Champion Mindset® on (+61) 1300 78 41 70. "Champion Mindset Success Coaching consistently is the best program in Australia. It worked for me. She provides valuable insights you don't find elsewhere, always impressed by the practicality and clarity. I am impressed how she coaches each member of the group according to their stage of development. "In an almost incomprehensively short period of time we identified what was handicapping me from reaching my full potential. We dealt with the issues and built a Champion Mindset. The results were immediate and I am the master of my own destiny, focused, balanced, giving and getting 100% out of life. NOW 6 months on: "The drug you gave me is still working!! I still feel incredible and I know that this feeling is here to stay." NOW 18mths later: "I have the best relationship with my team and my family." "We were stuck going over the same ground. Shelley's coaching challenged us to find the answers within ourselves. Now we are combining our talents and are a powerful team, enjoying the journey with an expanded view of the future. Thank you Shelley." "Shelley dug deep to find the real me and helped me break away all the shackles I had accumulated over the years. Yippee! It's me again and I love it. I now have a sense of calm, taken control of my life and feel comfortable in my skin. I passed my exams, achieved my degree with distinctions and am now successful in the new career in Ophthalmology." "There is one thing that Shelley can teach better than anyone else I know....the power of persistence and sticking to your dream. Her commitment to 100% focus in taking action to create my future and the goals in my company was contagious! Believe her when she says she will train you to create your Champion mindset!" "Balancing a full-time job with study is never easy, but producing an honours thesis while maintaining 50 - 60 hours working weeks seemed an insurmountable task. One weekend – 12hrs invested with Shelley made me re-think my approach and break it down into small, achievable goals. She inspired me, encouraged me and, most of all, enthused me about the journey ahead - a journey which ended with success! Shelley's approach is sensational. I highly recommend taking the next step, and investing in one of her Champion Coaching Programs." "After re doing my goals for the start of the Champion Executive Coaching Program I realised that I am after the simplest of things for my life goals. Yet had I put this on paper last year - it wouldn't have been enough - without coaching I wouldn't have accepted the simple goals as adequate." World Champion Gold Medalist Shayne Reece & Coach Rohan Taylor "When I contacted Shelley I was looking for a positive female role model. I was fully aware of her reputation as an athlete and speaker but also someone who could pass on ways to not only to perform, but also to handle pressure. The girls greatly benefited from the ½ day workshop experience with all swimming PB’s and Shayne Reese making the Olympic Team. Shelley also worked on strategies for the future in training and competition. Shelley provided me with great insight as to how to better communicate and how to provide the environment needed for success. As Head Coach it is my job to surround myself with great people to help me enhance my program and in Shelley I have found a great motivator! Cheers Shelley I look forward to the future." "Shelley was employed to prepare St Joseph’s 1st & 2nd VIII's psychologically for the Head of the River. We achieved the prestigious Australian National Schoolboy Champions 2005 title. Shelley is a woman of the highest integrity, totally professional and gifted with her ability to communicate positive messages to a variety of people. She brought a wealth of experience to the team and as a coach with 30yrs at Olympic, State, Club and Schoolboy level I found myself re-examining my own approach to the way I coached." "Her professional and dedicated approach to every task and project she undertakes impressed all who have worked with her over the years of her involvement in her role with Swimming Australia Limited. Shelley is extremely effective at both individual and team motivation. 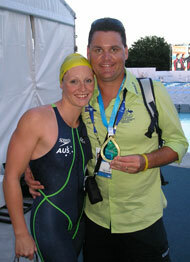 As coach her involvement saw one of my athletes in my squad go on to win a World Championship title. As Head Coach of the Australian Marathon Swim Team I have no hesitation in engaging Shelley's excellent services to motivate the squad of elite marathon swimmers preparing for the Beijing Olympic Games. Her well-refined presentation skills, ability to engage participants and excellent communication skills enable her to ensure all goals and outcomes are achieved through extremely thorough and dynamic presentations." "I would like to tell you that you are my hero. I have implemented what you taught me in the Champion GPS Success Coaching Program. All I can say to thank you is "You have given me everything" Without changing anything you managed to change everything. I now approach life from a totally different angle and regained a confidence in myself which has influenced all aspects of my life. I am again paddling, catching up with friends before and after work instead of sleeping, I feel inspired every day and have already got that special goal I wanted – you know the one! That’s some top work you did Shelley. You certainly can claim you get results. I am taking my Juice PLUS religiously and think of you every time I gulp them down. Thanks to you I am filled with promise and hope and look forward to charging forward and sucking as much as I can out of everything. Thank you for everything and giving me the knowledge to become me again." "The drug you help me find (self power and energy) is still working!! I still feel incredible and I know that this feeling is here to stay." 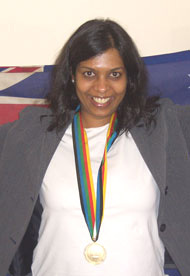 Dr Vini Kumar celebrating her victory! Performance Coaching: World Champion Gold Medalist Shayne Reece & Coach Rohan Taylor "When I contacted Shelley I was looking for a positive female role model. I was fully aware of her reputation as an athlete and speaker but also someone who could pass on ways to not only to perform, but also to handle pressure. The girls greatly benefited from the ½ day workshop experience with all swimming PB’s and Shayne Reese making the Olympic Team. Shelley also worked on strategies for the future in training and competition. Shelley provided me with great insight as to how to better communicate and how to provide the environment needed for success. I used to panic in the water and didn’t enjoy the swim leg of triathlons... Now I am calm and relaxed!!! I gotta get a copy of Dangerous When Wet NOW!